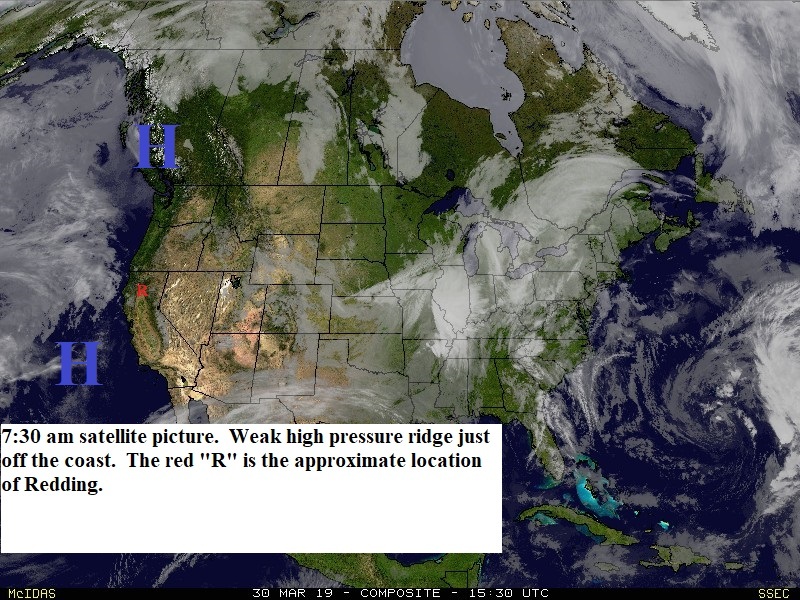 A weak high pressure ridge is just off the west coast. Today and Sunday Northern California will see mostly sunny skies with a few clouds over the mountains. Temperatures will be slightly above normal and winds will be light. Monday and early Tuesday a weak low pressure trough will move through the area with clouds and light rain over the foothills and mountains and valley north of Chico. Snow levels will be 6000 feet or higher. Wednesday and Thursday look partly to mostly sunny with near normal temperatures. Friday the jetstream will strengthen and push eastward across the Pacific (see map below). It looks now like this will push a low pressure trough through the north state Friday and early Saturday with another possible on Sunday. These systems will bring more light rain to Northern California.